Lobster boats are seen moored in Stonington, July 13, 2014. ST. GEORGE, Maine — The intentional sinking of a lobster boat here last week is part of a seasonal pattern of vandalism that ticks up when lobster season kicks into high gear, according to officials. But the sinking does not mean that yet another “lobster war” has been declared in the midcoast, they added. Col. Jonathan Cornish, head of Maine Marine Patrol, said last week that with 30 registered complaints statewide of trap molestation this year, the number of incidents of territorial disputes are about average for the season. The statewide total, eight of which were from the Tenants Harbor area, is the same as in the past few years, he said. Cornish added, however, the agency has seen a spike in complaints statewide during the past two weeks. Complaints typically rise during the peak harvesting months of September and October, he said, when lobstermen shift their traps to where they are seeing their best catches or to move further out from shore to coincide with the migration of the lobsters as the waters close to shore cool down. The marine patrol chief said there have been complaints received in the midcoast of traps being cut since the latest boat sinking. The owner of a the sunken boat, who was involved in a 2009 lobstering dispute, said he is stunned and that he had not been in conflict with the people accused of the crime. The fisherman, Joshua Hupper, 34, talked with the Bangor Daily News Friday to “set the record straight.” Hupper said he had no disputes over traps or territory with anyone leading up to last week’s incident. A sixth-generation lobsterman from St. George who has been fishing since he was 7-years-old, Hupper said he had hauled traps on the day prior to the sinking and went out in his skiff in the local village of Tenants Harbor before sunrise on the morning of Sept. 1. When he arrived to where his boat, the 36-foot Oracle, was moored, it was three-quarters under water. He said the cabin door was open and lights were on, which made him realize someone had been aboard the vessel. “I was in shock for 10 minutes,” Hupper said. There have been other recent incidents in the midcoast, which has a history of vandalism and confrontation between fishermen, that have resulted in criminal investigations. Another lobster boat was sunk Aug. 17 in the St. George village of Port Clyde. No one has been charged in that incident, and police said they don’t yet have a suspect. In addition to the sinking of the two lobster boats, a Rockland lobsterman was charged last week with aggravated assault against a fellow lobsterman over a trap dispute in August in Owls Head. Such violent disputes occur elsewhere along the Maine coast, too. In March, a Stonington fishermen pleaded guilty in federal court to setting fire to and destroying another fisherman’s boat in 2014. The last time that boats were intentionally sunk in Knox County was during the summer of 2009, when two boats were sent to the bottom of Owls Head Harbor and an attempt was made on a third one. No one was charged in those crimes. That also was the summer when a lobsterman was shot and wounded on Matinicus Island during a territorial dispute. A Matinicus man and his daughter were both acquitted of crimes in connection to that shooting. That lobster war occurred during a downturn in the lobster industry, but this summer has seen prices reach a 10-year high, according to SeafoodNews. com. The marine patrol has increased its presence in the St. George area in an effort to try to prevent further conflict, according to Cornish. If problems continue, he said the department would consider holding a community-wide meeting of lobstermen to discuss their concerns. He said that has been done in the past when major disputes have flared. Jeff Nichols, director of communications for the Maine Department of Marine Resources, said the territories where lobstermen harvest are largely determined by local unwritten rules. He said newcomers to the industry generally speak with the current lobstermen before placing their traps. Nearly 4,400 lobstermen harvested a record $495 million worth of lobsters last year. Knox County had the second largest catch of any county in Maine last year at 34 million pounds valued at $141 million. Hancock County is the leading harvester in the state with nearly 42 million pounds valued at more than $167 million. Patrice McCarron, the executive director of the Maine Lobstermen’s Association, said she has not heard of any unusual concern from fishermen about disputes. 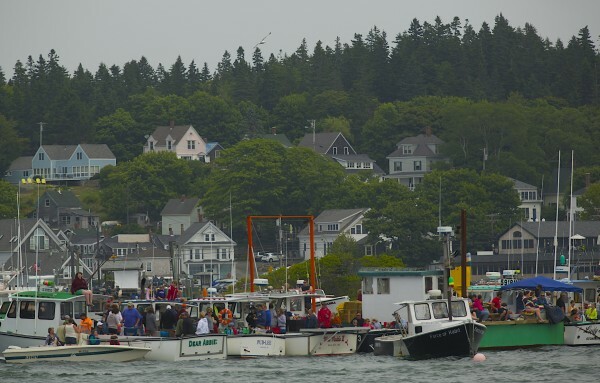 The lobstermen’s association is a 62-year-old organization that advocates for the harvesters. McCarron said it still was relatively early in the season since September and October are the largest months for landings. “So far, it’s been a very good year. Our biggest challenge has been bait supply,” she said, referring to the summertime shortage of herring. The marine patrol colonel said that the agency takes trap cutting seriously because of the economic impact it has on the lobstermen. The cost to replace a three-foot long trap is $60 to $70 each. In addition would be the loss of an average of two pounds of lobsters each day or about $10 per day per trap. Lobstermen along most of Maine’s coast can have up to 800 traps in the water at a time. Some lobstermen have their traps on a trawl line on which there may be up to 15 traps, all of which could be lost when one of those lines is cut. Hupper said his boat will be out of the water for four to five weeks, with damage far exceeding the initial $50,000 estimate. The vessel is insured but the insurance does not cover the income he will lose over the next four to five weeks during the peak harvesting season, he said. Hupper said he is grateful to the community and his family for rallying around him during this difficult time. The vessel is being repaired at Journey’s End in Rockland. Vincent Hilt, 22, of Vinalhaven and Devlin Meklin, 20, of Warren have been charged with felony criminal mischief and felony theft for allegedly stealing a skiff and sinking the boat. Hilt told police he had been offered $500 by another lobsterman to sink the boat because of a trap dispute, according to the affidavit filed by the Knox County Sheriff’s Office in Knox County Unified Court. Hupper said he knows of no reason why Hilt and Meklin or the fellow lobsterman who allegedly offered $500 to Hilt to sink the Oracle, committed the act. He said he knows the man who allegedly offered to pay for the sinking and that they wave to each other when they are on the water and that the man even returned a few loose traps belonging to Hupper. Knox County Sheriff Donna Dennison said Wednesday, however, that she expects that man will be charged as well.